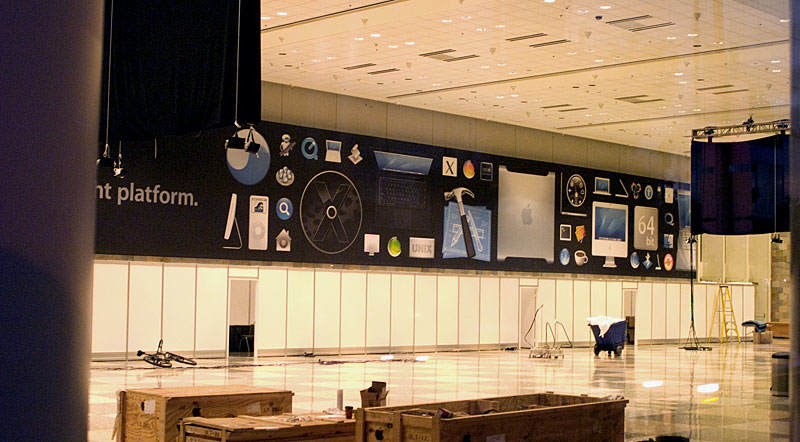 To increase speculation and heat up the rumors, someone has published a shot of a WWDC banner in the Moscone Center. Some of the images in this banner give us clues to what is to be announced/talked about on Monday. The banner doesn’t reveal too much, but it looks as if the Mac Pro will come with a 64-bit processor. Also note many other hanging banners are covered and also no sign of the fifth-generation iPod anywhere on the revealed banner. Maybe the chances of a new-generation iPod are greater than expected. Take in account that the PowerMac G5 on the banner is most-likely not a Mac Pro. Apple would not be stupid enough to put anything on the banner that would spoil the fun for everyone, so I highly doubt that that PowerMac G5 is a Mac Pro. I know this is an old post but I couldn’t resist from commenting on how that PowerMac on the banner ended up being the Mac Pro. Apple sure outsmarted all of us by keeping a very similar external construction and only showing the side view leadings us to second doubt the release of the Mac Pro.